Who is the Holy Spirit? What does the Holy Spirit do? How can I be filled with the Holy Spirit? How can I make the most of the rest of my life? Even if you haven’t been apart of an Alpha group, you are welcome to attend. Everyone should have the chance to explore the Christian faith, ask questions, and share their point of view. 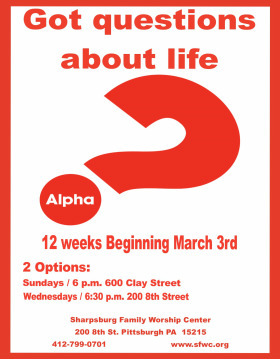 Alpha is a weekly series of 12 sessions exploring the Christian faith. Each talk looks at a different question around faith and is designed to create conversation. At Alpha, everyone is welcome! Invite a Friend!